When we talk about correcting uneven smiles, we find many of our Des Moines, IA, patients are mainly concerned with their smile’s appearance. However, addressing misalignment actually helps improve oral health and offers a number of benefits. 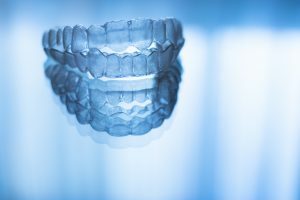 In today’s blog, we’re looking at how our clear aligners help treat misalignment and prevent the complications of an uneven smile. What benefits with fixing your poor alignment offer? Well, you will have a much easier time thoroughly brushing and flossing your teeth, which helps reduce the risk of tooth decay and gum disease. You also relieve any pressure on the jaw joints due to poor alignment, which helps reduce the risk of TMJ disorder and bruxism, common jaw joint disorders that could damage teeth and cause headaches and jaw pain. Patients with better alignment also enjoy more attractive smiles, and may enjoy a boost in self-confidences. Fist, treatment doesn’t employ metal brackets and wires. Instead, we use a series of aligners created from a BPA-free clear plastic. We gather detailed digital images of your smile, which creates a 3D digital impression. At an Invisalign® lab, experts employ these images to design and create your aligners. Once complete, you will begin wearing them to treat your alignment. Total treatment time will depend on the cause and extent of your misalignment (and if you wore them as the dentist prescribed) but usually takes about a year for adults, and up to 18 months for teens. Each day, you will wear a set for around 20 to 23 hours. After about two weeks, you will upgrade to the next set. During periodic visits, we will monitor your progress. Over time, this repositions your teeth and corrects misalignment. In addition to being clear and practically invisible, your aligners can also be removed. Taking them out before meals means you don’t have to change your diet, which you would have to do if you had metal braces, since sticky foods could become trapped in them. Removing them before you brush and floss your teeth also makes caring for your smile during treatment much easier. Finally, you can take them out for a special occasion, such as a graduation or a date. If you have any questions about treating poor alignment or about our clear braces, then contact our team today. We want to help you enjoy a more beautiful smile! With our custom-made clear aligners, we help you enjoy better alignment without impacting your overall appearance. Our practice is ready boost your smile’s beauty in Des Moines, IA and help patients enjoy optimal oral health. To schedule an appointment, call our office today at (515) 244-9565.